The Braves came to Jacob Webb in 2016 -- one year after he'd undergone Tommy John surgery in what was meant to be his first full season -- with a question. Did he want to start or relieve? Having already begun down an unorthodox path in baseball that included a failed attempt to be a two-way player, two years at an NAIA school and a spot in the 18th round of the 2014 Draft, Webb chose the tougher road for low-level prospects with limited pro experience. And that has made all the difference. "I would rather relieve, no doubt," he said. "I feel like I can give more when I'm able to get more behind the ball, instead of gradually trying to spread out my stuff over longer periods. I like going all out the moment I'm out there. I like throwing more often with less workload. That way I could manage my health a little bit more, too. But I just thought relieving fit me a whole lot better." Almost three years later, it's clear Webb made the right call. The 25-year-old right-hander is ranked by MLB.com as the No. 28 prospect in a loaded Braves system and got the biggest news of his career so far when Atlanta added him to the 40-man roster on Nov. 20, deeming him necessary to be protected from the coming Rule 5 Draft. Such a transaction seemed a distant dream when Webb first left high school in his native Riverside, California. Hoping to play two ways, Webb first went to Riverside City College but was held back by injuries in his one year there. Still, a training partner knew an assistant coach at Tabor College and sent over videos of his workouts, and in the fall of 2012, Webb enrolled at the NAIA program in Kansas. Though he was listed as a pitcher/third baseman that spring, all 19 of his appearances -- two of which were starts -- came on the mound. He finished with a 2.29 ERA with 50 strikeouts in 55 innings. The following year, he was the Bluejays' ace, leading the program to its first NAIA World Series appearance and posting a 1.88 ERA, 0.93 WHIP, 129 strikeouts and 27 walks over 105 innings across 16 appearances -- 15 starts. Those are the type of numbers that typically get at least some attention from area scouts, and Webb did receive base-level questionnaires from several Major League clubs. Yet again, though, he had a connection that opened a new door. Assistant coach Andy Davis started working with Tabor pitchers the same spring Webb first appeared with the Bluejays, and his father was Braves scout Rick Davis, who took a liking to his son's star pupil. "His dad would talk to me here and there, say things like, 'Hey, there will be a cross-checker coming out to watch you for this game,'" Webb said. "I'm not sure if he had a lot of pull in terms of [my] getting drafted, but I know if he saw somebody who could help the organization, he'd speak up. That definitely helped. Luckily, it was the Braves who ended up drafting [me], and it was pretty awesome to have that opportunity." Indeed, Atlanta came calling in the 18th round of the 2014 Draft, thus expressing interest in Webb's tools (namely a low-90s fastball and a decent slider) but giving him long odds to make much noise in the Majors someday. The last Atlanta 18th-rounder to reach the bigs with the club was 1994 pick Derrin Ebert. Reliever John Rocker, taken one year before Ebert, is the all-time leader in career WAR (3.5) among signed Braves 18th-round picks. Going deeper in Webb's Draft class of 1,215, only 37 players were taken from NAIA schools. He, in fact, was the first Tabor pitcher ever selected. Webb wasn't exactly in esteemed company, but he was a pro ballplayer. The Braves moved the 6-foot-1 righty to the Gulf Coast League for his first summer, using him as both a starter and a reliever. His future role was still to be determined when he returned to Florida for his first Spring Training months later, but he suffered a torn ligament in his pitching elbow on the first day back and underwent Tommy John surgery soon after. In 2016, with Webb slated to get on the mound when short-season ball began in June, the Braves posed the question of his preferred role. He became a reliever with Rookie-level Danville -- mixing in two appearances with Class A Rome in July -- and a good one, at that. Webb recorded 34 outs during his days in the Appalachian League that summer; 28 of them came via the strikeout. His sample size was small -- only 13 innings between both stops -- as Atlanta limited him to about one appearance per week and only one inning at a time. But among the 4,168 Minor League pitchers to throw at least 10 innings in 2016, his 53.5 percent strikeout rate was right there at the top. Recovered and rehabbed, Webb took on a reliever's full workload for 2017 and again stood out. He posted a 2.07 ERA with 74 strikeouts in 65 1/3 innings between Class A Advanced Florida and Double-A Mississippi, though he did show some control issues with 36 walks. Because he'd been taken out of college, Webb was eligible for last year's Rule 5 Draft but went unprotected and unselected -- in part because of his lack of a healthy pro track record, he believes. "It was a possibility," he said of a 40-man roster addition last year. "But even in my own opinion, I just don't think I'd put in enough innings after Tommy John to really make that something that was going to happen. I'm guessing they wanted to see me a little bit more, so I made that more of a goal for this season." Another year removed from the surgery, in 2018 Webb made some alterations to his delivery that allowed him to climb within one rung of the Major Leagues, and his stuff took a bit of a jump. His fastball now regularly clocks in the mid-90s with a high spin rate that brings added value in the modern age. He also found the strike zone with more regularity, helping his stock. "I would say making the leg kick less erratic was the biggest adjustment," he said. "I use it in a smaller way now. It helps me to land softer on my front side when I'm coming down, and that helps with control. I'm able to throw better directionally now." The Braves took notice. 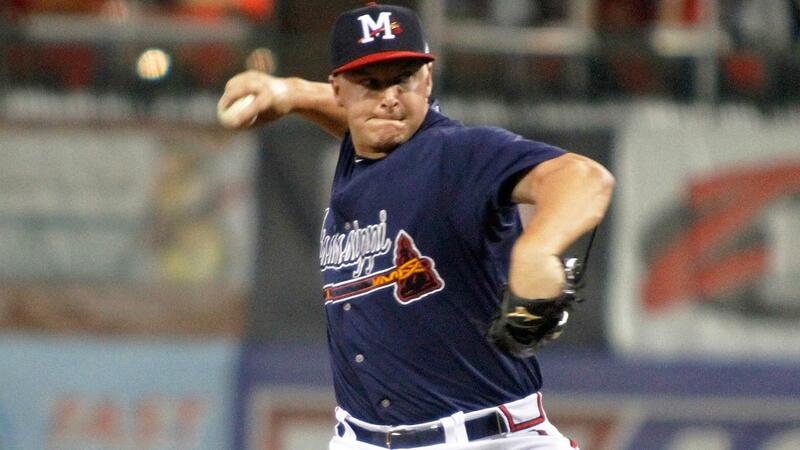 After opening the season as a multi-inning threat, Webb became Mississippi's closer by mid-April and finished with seven saves, a 3.18 ERA, .195 average-against and 35 strikeouts in 22 2/3 innings with the Double-A club before receiving a Southern League All-Star nod and a promotion to Triple-A Gwinnett in June. Despite the bump, Webb continued to pitch primarily in the later innings with the Stripers and was downright untouchable by the end of his time in the International League. After some early hiccups, he posted a 0.96 ERA, .141 average-against and 0.70 WHIP with 20 strikeouts and four walks in his final 18 appearances (18 2/3 innings) from July 12 through the end of the season. He recorded a save in nine -- half -- of those outings. "I feel like I fit well into the closer role," Webb said. "I like the pressure of the game being on the line. It gets me going and in the right mindset the moment I get on the mound. It's not for everyone, obviously. But I like taking a bulldog mentality out there: 'Here's what I'm throwing. Just see if you can hit it.'" Atlanta didn't summon Webb to the Majors for the stretch run, choosing instead to make top prospects like Kyle Wright and Bryse Wilson into right-handed options out of the bullpen, but the team made sure to find a 40-man spot for the Tabor product alongside other Rule 5 protectees Huascar Ynoa, Patrick Weigel and Alex Jackson. Even after all he'd been through, Webb knew that was far from a given. "These last four years have been a grind," he said. "You really learn that you can't take anything for granted. You have got to work for stuff. We are facing the best. They're all good, everyone we're playing on a nightly basis. You can't go through the motions. I wouldn't be here if I did that." Come next February, "here" will be the Major League side of Spring Training for the first time. There may not be any more questions about his role, but Webb is ready to provide answers all the same -- just as he did beginning three years ago. "I think it'll be a little more eye-opening," he said. "I'll be with the big league guys, competing right alongside them. But it'll be a fun experience at the same time. I'll be the new guy, so I'll get to meet all the coaches, everyone in that room. Hopefully, I'll make the team. Hopefully, I'll make the Atlanta Braves. It's a very real possibility now. It's just a matter of how hard I work."